As an official food & fun expert, I’m always asked to name my favorite restaurants, the hottest of-the-moment spot or what places an out-of-town friend should not miss. So I figured why not post some of these emails, tweets and Facebook messages with my answers. Hence, the new Marpop series, “Ask Mar.” Keep in mind these are super caszh exchanges with no regard for proper sentence structure, grammar or punctuation. (Trust. I’m an editor & writer first, so I just want you to know that I know.) And remember: If you have a question, just Ask Mar! Do you have any recommendations for nice/yummy/new restaurants on the west side? Got friends from ny visiting your sm hood! if they don’t mind spending a little $$$ (or a lot), then they def gotta do the Rustic Canyon (fresh, farmer’s mkt, etc..) – was there recently & dropped a quick $150 but i didn’t care! also sister location Huckleberry is a more casual sandwich & pastry shop – omg best peach pastry evah!!!! both on Wilshire in SM, both ridic good. Fraiche – right by the promenade, has a great all-nite happy hour EVERY DAY – they just changed it! $6 salmon tartare, $6 turkey burgers, margherita pizza, wine … plus it’s next to all the shops, perfect for walking around afterward. Stella Rossa – omg best pizza on westside – MUST order the spinach & purple kale white pizza (thin crust!!) 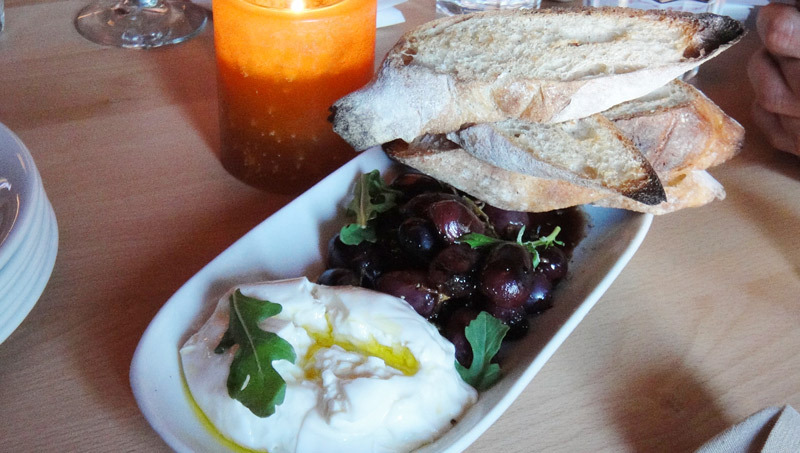 and wood-oven grapes w/burrata & homemade bread – to live for!!! Tiato Cafe – total hidden gem, nobody knows about it cos it’s in the MTV building! huge space, great patio, deeelish fresh food, very seasonal – spicy eggplant & tofu is ridic – also famous garlic noodles & awesome fish dishes. True Food @ the new mall is great – first found out about it at the Scottsdale location – really healthy, Dr. Weil’s place – super good hummus, TLT sandwich (tempeh instead of bacon) and turkey bolognese – yum. Jiraffe – good, clean light cali fare – they do Monday Night Bistro menu for $38 (three courses) and offer discounts on certain wines. Sugarfish on 2nd Street – omg fave sushi place!!!! so fresh & totez affordable – $35 “trust-me” omakase, are you kidding me?! best crab handroll in town – prefer this to Sushi Roku. Misfit – new place right by promenade – cool bar, open late, people like the burger but i always do veggie stuff — do the kale salad & whatever’s in from the farmers’ market – also free cookies! Now … what’s your question? Sunny Blue serves omusubis. Miso beef and spicy salmon are definitely recommended and Amelia’s is a quaint little cafe, but serves a huge, hearty, delicious roast beef sandwich that is the best I’ve had. If you try either, let me know what you think! Thanks Mar! Thanks for the comment, Emil. Seems we have similar tastes. I have not tried Amelia’s or Sunny Blue -what are YOUR recs?! I love the new Ask Mar section! I’ll have to check out Tiato Cafe and Misfit. And speaking of happy hours, maybe that can be one of your future questions to answer. I’d love to freshen up my list of happy hours on the west side. Yes, I’ll have to work on a happy hour list! The key is finding ones that go on all night or at least til 8pm! great list! i’ve been curious about fraiche since it was on “curb your enthusiasm” the other night! Right! I couldn’t believe it was on the show — I actually prefer the happy hour to the actual dining menu – and it’s much more affordable!